When you’re in the mood for good times, pleasant dining and great cuisine, Terra-Cotta can’t be beat. This air-conditioned restaurant offers an inviting atmosphere that is perfect for casual dining with family and friends. The menu at Terra-Cotta features a wide array of great selections made only from the freshest and highest quality ingredients, with something sure to please every member of your group. Terra-Cotta has established itself as one of Huatulco’s favorite culinary destinations and is sure to offer you an enjoyable dining experience every time you visit. Shrimp sauteed in garlic butter and served over pasta in a creamy tomato sauce with fresh mushrooms. Three crepes filled with cuitlacoche, a corn fungus better known as the Mexican truffle. The crepes are smothered in a poblano chili sauce and covered with grated cheese. Fish fillet covered in a Veracruz-style sauce made from tomato, onion, bell peppers, olives, capers and güero chili peppers, served with rice. 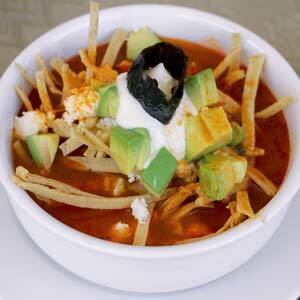 Traditional recipe topped with fried tortilla strips, diced avocado, sour cream and fresh cheese. 200 grams of Filet Mignon and sautéed shrimp served over a creamy chipotle sauce accompanied with rice and steamed vegetables.